Developmental Theorists describe this pattern with the term “wave-like change.” Big step forward, little steps back, big steps forward, little steps back. This pattern carries on for years, as children grow, mature, and respond to the socialization pressures exerted from home, school, and social encounters. Change isn’t smooth, nor linear. But it is orderly, once you know what to look for in terms of the pattern. You get the picture. The pattern has gone on for quite some time, too. Millennia, in fact. Once upon a time, a very long time ago in history, a grand leap in the philosophy of education was established. The idea was this: if adults want their children to grow up wise, healthy, and able to lead interesting lives while running the country well and with integrity, youth need to learn some things in school. They needed to learn to use language properly, to craft sound arguments, to manage their finances, and to understand the world (and cosmos) around them. The intellectuals of the time gave their educational philosophy a name. They called it a “liberal arts” education. Free youth (i.e., this was the time of the Greeks and Romans) were expected to learn the “scientific arts” of music, arithmetic, geometry, and astronomy. And they were expected to learn the arts of the humanities: grammar, rhetoric, and logic. Youth need to know several ways of thinking and of problem solving in order to mature into healthy, functioning adults. They need to master a variety of fields that reflect the complexity of our society, and they will eventually then aptly apply the skills learned in their adults dealings and trades. What’s happened over the millennia, regarding progress in the notion of how to best socialize youth so they grow to be happy, healthy, functioning adults? Don’t worry, I’m not going to list all the trends in educational philosophy. If you are reading this you probably have a pretty good idea of the variety out there, anyway. 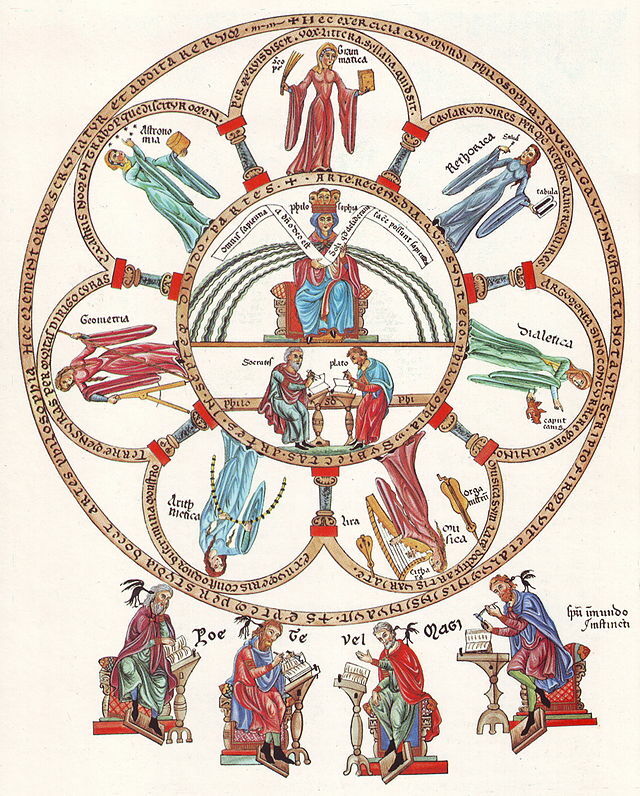 Suffice it to say that over the millennia, we humans keep coming back to the “liberal arts.” As with the pattern laid out above, each grand step forward represents a “new take” on the matter, but at the core of it the belief that youth need to know a variety of skills remains steadfast. Currently, especially here in the US though, educationally speaking, we are losing sight of the inherent value in the liberal arts ideal. Rather, as politocos worry about our international rankings on tests like PISA, they clamor for narrowing of focus in school, increased seat time, and reduction of electives like recess, pe, art, and music. Indeed, national policies such as the Common Core are far removed from those initial ideals of the liberal arts. The Common Core emphasizes the acquisition of facts over the establishment of skilled ways of thinking and being. 1. For healthy brain development, kids need to move & exercise. They need recess and PE. 2. When kids are frustrated, they momentarily lose gains in cognitive growth. The more their frustration builds, they longer it will take for the brain to recover itself. For example, withholding recess for transgressions in the classroom will only add insult to injury. 3. Content knowledge (“facts & figures”) is pretty pointless without a bedrock foundation of skills. For example, very young kids really need to master things like phonics before they can make gains in reading comprehension and things like “order of operations” before they can make gains in mathematical literacy. 4. All kids need deliberate time spent on honing their ability to focus attention, control impulses, and take the perspective of others. And you know a great way to practice these skills? Through free play. Kids who get to play freely tend to do better in school. As noted before, the current educational climate here in the US ignores these things and the rational for each makes little sense, in light of research findings on the growth of human cognitive and social capacities. Indeed, the rationales noted here are anecdotes only, not the results from well designed studies. Recess time is diminishing because not only does it take away from “seat time” but it opens the door for bullying opportunities. PE isn’t worth the money, when money is in short supply. Why exercise when national test scores are hanging in the balance? Music class is also too expensive, for the same reason as PE. Art class …same as above. Kids need knowledge: that’s what will help them score better on tests. On the surface, taken one at a time, downplaying the importance of things like PE, art, music, and recess may not seem like a big deal. But all together, the compounding effect is that youth are asked to sit in the classroom for longer and longer periods of time, focusing on an increasingly narrow range of topics, with frustrations building and no time for regular breaks. All this is counter to what we know to be true about optimal learning environments. From research in the learning and cognitive sciences, we know that academic growth and achievement does not increase in a linear function, alongside an increase in “seat time.” Indeed, the function is anything but a positive linear trend. For example, it takes less time, overall, to master a skill when its studied in short regular intervals with breaks, than it does when the learning is crammed into longer sessions with fewer breaks. That’s right: more breaks means less time needed for mastery. But that research finding isn’t finding its way into our public schools. Rather, as students’ frustrations build from limited breaks and less variety in topics & skills covered, their cognitive skills dwindle from their optimal levels. Youth in many public schools across the country (the US, in this case anyway) are experiencing conditions that thwart rather than enhance learning. This trend needs to stop. A great step forward needs to happen, and fast. What should that step forward look like? Before jumping ahead, I think much could be gained if we started with a clear and decisive look back. We need to recapture what was good from the old “liberal arts” traditions and remake them in a modern form that respects all we now know about brain growth and human development. Concentrated research efforts in Cognitive and Developmental Psychology and Cognitive and Developmental Neuroscience, together, have yielded rich array of findings relevant for education. Keeping in mind both the old and the new, take a moment to think about that list of the original 7 liberal arts areas of endeavor. Do you see what I see? What I see is this: those areas of inquiry emphasize skills over facts. Sure facts are part of the learning process, but each area here requires skill before the recitation of facts. As Dr. Diamond remarks in the interview linked above (and I do frequently in my classes as well), if you teach youth how to learn, they can find the facts out themselves. But if you teach them facts without the skills behind how, they are just left with those facts and nothing more. (as an aside, I’ve also been known to say the same about teacher training– that if you teach pre-service teachers about cognition, development, and learning, they don’t need a curricular package once they start their jobs). Indeed, this argument can be made for any level of education: k-12, public, private, and college/ graduate studies. Refinement of skills, in the areas of endeavor that reflect the complexity of our great and wonderous world, will serve students well, and will help us regain footing lost in the current educational climate we find ourselves steeped in. Calls for educational reform are everywhere, but the traction we currently see in our government isn’t centered on what I discuss here. Clearly, many folks want to see something different, hence the active reform movement. So I say, let’s use the resources available to us — past and present — to chart a solid path forward. Let’s make what was old new again, but new and improved, of course! Very informative piece. Keep up the good work! I keep coming back to the notion that the working environment we’re creating for kids in public schools is one that most adults would find unacceptable. If it’s not good enough for adults, then it’s certainly not good enough for our future leaders. Thank you for sharing your thoughts. I absolutely agree! Very interesting post. Thanks for sharing. It seems so counter-intuitive to be forcing play and recess out of the school equation when playing freely is clearly such a key to facilitating learning! So true. Hard to imagine, really, how anyone can justify it. Not only does research show unequivocally that such things enhance development, but wise adults — parents, teachers, caregivers — see first hand the benefits of a varied day for kids!